Failing to walk away when the applause was loudest, the sins of Ghana Football Association (GFA) president Kwesi Nyantakyi has been listed by sports analysts that his reputation has taken a nasty hit. The popular refrain is that the unpopular decision to sack his vice-president George Afriyie was the latest sign of a power-drunk football czar. Nyantakyi is wanted for defrauding by false pretence after he allegedly used the name of the president, Nana Akufo-Addo, to peddle influence. The President of the nation wants the President of an Association investigated and there has been no mild jubilation on social media since the announcement. Ghana’s most iconic sports presenter Kwabena Yeboah, sports analysts Veronica Commey and Gary Al-Smith weighed Mr Nyantakyi’s 13 years at the helm and concluded, he has overstayed his welcome. “He grew bigger than everybody else,” Kwabena Yeboah, who supported the lawyer’s 2005 bid to become GFA President, said. Kwesi Nyantakyi was elected GFA president at an unlikely age of 34 and led Ghana to its first appearance at the World Cup in 2006 and repeated the feat twice – in 2010 and 2014. “He was beginning to believe the hype,” the GTV Sports presenter said on the Joy FM Super Morning Show Wednesday. Mr Yeboah thought unfavourably of Kwesi Nyantayki to dismantle his inner circle, Randy Abbey and Fred Pappoe in 2012. Since then, those around him have grown fearful and have preserved their proximity to power through predictable sycophancy. Kwabena Yeboah said local football people grew scared of the man of unrivalled international repute and is a privileged clique of FIFA officials who set the vision for world football. Nyantakyi is decorated with two positions at FIFA, second in command at CAF and conquered West Africa Football Union after he was elected president in 2005. He also has his own fan club in Ejisu in the Ashanti region. No Ghanaian has been able to put Ghana on the map of the football administration since independence, the sports analysts agreed. As his privileges and chores at FIFA and CAF grew, Ghanaian football administrators privately held the hope he would find the GFA post a fettering unfancied distraction and decline to seek re-election in 2019. And for some time, Kwesi Nyantakyi did tell Ghanaians and football people, he would not seek re-election. But after his Vice-President George Afriyie showed his hand to contest, his boss Kwesi Nyantakyi dismissed him in unceremonious circumstances as he declared the intention to seek re-election. With the latest scandal, GNA Sports analysts Veronica Commey said if corruption shook the foundation of FIFA in 2015, this scandal will do nothing less for GFA. She said the order alone from the President soils Nyantakyi’s reputation “a bit” and may compel him not to seek re-election after all other persuasions failed. Commey feels FIFA intervention to restructure GFA is imminent. “It is almost unimaginable to think FIFA would not intervene,” she said and saw this scandal as a “huge opportunity” for Ghana football to re-organise itself. 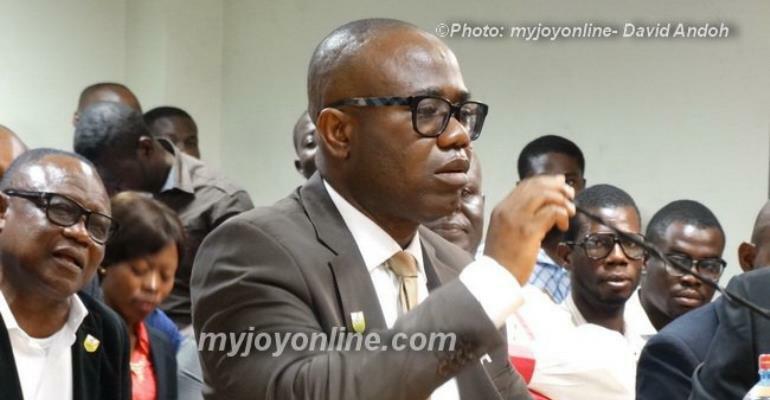 Joy Sports’ Gary Al-Smith weighed in on Nyantakyi’s chances of walking out free after telling investors to pay $5 million to get access to the president, a man he claimed he has in his pocket. He believes Nyantakyi is a cat with eight lives and pointed to a chronicle of eight “serious cases” in which the lawyer was able to survive unscathed. GTV presenter Kwabena Yeboah, a “chief Nyantakyi backer” when he appeared on the scene in 2005 thinks he must now disappear from the scene and resign.